Dimension(L x W x H): appr. 3.3″ x 2.3″ x 1.8″ ( 8.5 x 5.8 x 4.5cm); weight: 60g. Romantic art design box, beautiful and charming. Jewelry isn’t included. Showcase your exquisite rings in this special hollow art ring box to reflect more special feel. An excellent gift box choice for those who love to create and gift their own jewlery. The soft velvet provide reliable protection for your cherish jewelry. 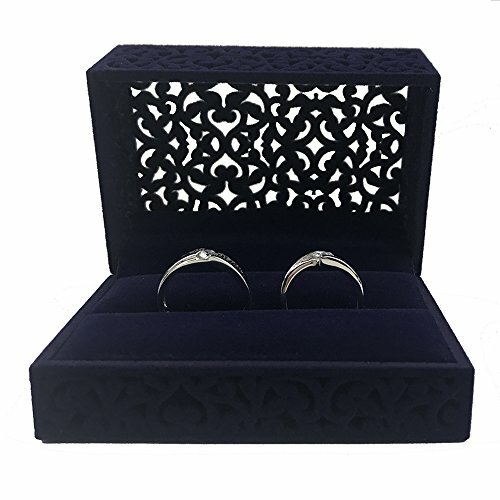 The double ring box is great for your wedding or engagement ceremony. This is also a perfect statement Gift Box suited to small gifts for family and friends as well as retailers, re-sellers of and premium jewellery traders. Exquisite hollow art design, covered by soft royal blue velvet, romantic style. Showcase your jewelry & gift in this exquisite box. The Inside velvet will protect your ring from scratches. Ideal beautiful ring box for engagement, wedding and anniversary.